Each ametropia, depending on its visual correction and its needs, is a unique case. The choice of lenses also should be unique. This choice is unquestionably a function of the confidence that the client places in the optician. Analysis of the client’s needs, type of work or sports played are factors that must be taken into consideration in order to optimize vision and comfort. Increasingly challenged by the screens in use every day, from the Smartphone to the tablet and the computer to the television, good vision requires the right lenses. The French insist on high-quality healthcare. 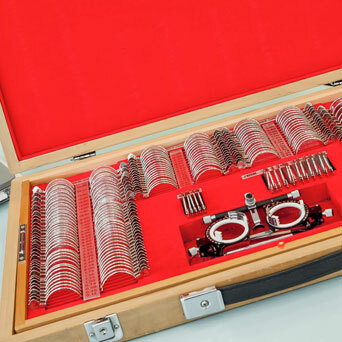 It is, therefore, essential to ensure the quality of the lenses on offer. We have opted for excellence by selecting the most innovative brands in our constant search for better vision. Essilor, Zeiss, Nikon, Seiko and Optiswiss are our official suppliers. Each pair of eyeglasses is delivered with a certificate of authenticity that guarantees the origin of the manufacturer and the correction prescribed by the ophthalmologist. Myopia, hyperopia and astigmatism are corrected by unifocal lenses. Presbyopia also can be corrected by unifocal lenses. But whether or not it is associated with one of the other types of ametropia described above, presbyopia is most often corrected by progressive or mid-distance lenses. Not to mention those lenses that correct all types of ametropia. Depending on the level of refraction, asphericity and degree of personalization, the thinness and lightness of a lens can vary considerably. Only “made-to-measure” can provide maximum comfort. Many different types of lens coating can be proposed: non-scratch or scratch resistant, non-reflecting, anti-fog, hydrophobic, oleophobic, UV protective, photochrome, UV filter, solid tint, shaded or mirrored… the list is endless.